A compulsive bookwork grounded in the drive to repeat things. ‘Wiederholungszwang’ is a term Sigmund Freud used for repetitive behavior in which a person repeats certain traumatic events. 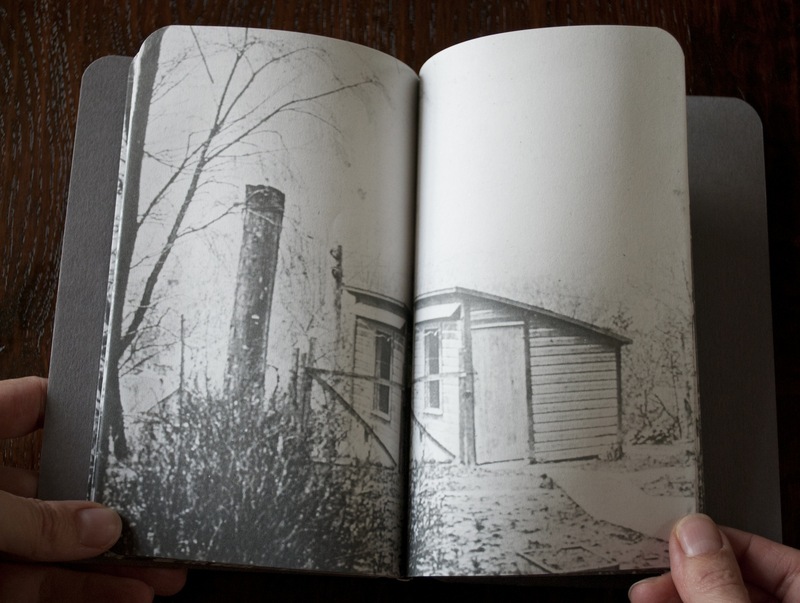 The book is made up out of a single image, a found lantern slide, that becomes a scene of repetition when it is fragmented, folded, repeated and mirrored. The image is split into fragments on folded sheets. Each sheet is repeated like a stammer by a sheet that is its double. Meanwhile the book also mirrors back on itself, even though none of its sets of doubled sheets is exactly the same as any of the other sets. At the end of the book its mirror structure forces a deviation from this scheme, but this deviation is at the same time to be seen as another case of repetition compulsion. The book also repeats some of the elements of an earlier book, Contemplation. The book is inkjet printed in black and white, and handbound in a stab binding with folds on the foredge. It contains 30 pages. Published in an edition of 28 numbered copies in Leerdam, The Netherlands, 2014. The book is priced at €150,- Order through email or through the webshop. Available in the collections of Bibliothèque Kandinsky (Centre Pompidou), Jan Michalski Foundation for Writing and Literature, Kunstbibliothek (Berlin), National Library of The Netherlands (Koninklijke Bibliotheek), Zentralinstitut für Kunstgeschichte (Munich). Through subtle shifts of viewpoint made by slight realignment, we wander tentatively through the pages, aware that the scene remains the same yet not the same. It is similar to catching sight of something out of the corner of your eye, is it really there or just a passing shadow?